It's no secret that we've been openly critical of the prices charged by automakers for built-in GPS navigation systems. Frankly, paying $2,000 or more for an in-dash system when you can buy stand-alone navigation units for as little as $100 is ridiculous. Even the newer, larger seven-inch screen units are now down to as little as $250, and even though they aren't tied in to a vehicles' wheel sensors, they tend to be plenty accurate. Now, however, there is a new option that is even cheaper – as in (sort of) free. It's only "sort of" free because the Google maps turn-by-turn navigation app is built into the new Motorola Droid smartphone (see sister-site Engadget's full review of the Droid here) that recently became available from Verizon Wireless. In this case, you have to sign up for two years of mobile phone service, which includes a data plan. I've been a Verizon customer for a decade and just happened to be up for a biennial discounted phone upgrade. When the Droid appeared a few weeks ago, the plan to wait until the new year for a Palm Pre was discarded. We've now had the chance to play with the Droid and its new navigation software, so follow the jump to find out if it lives up to expectations. If you plan to use the Droid in a car, we recommend getting the $30 car dock that uses a suction cup mount to hold the phone to your dash or windshield. 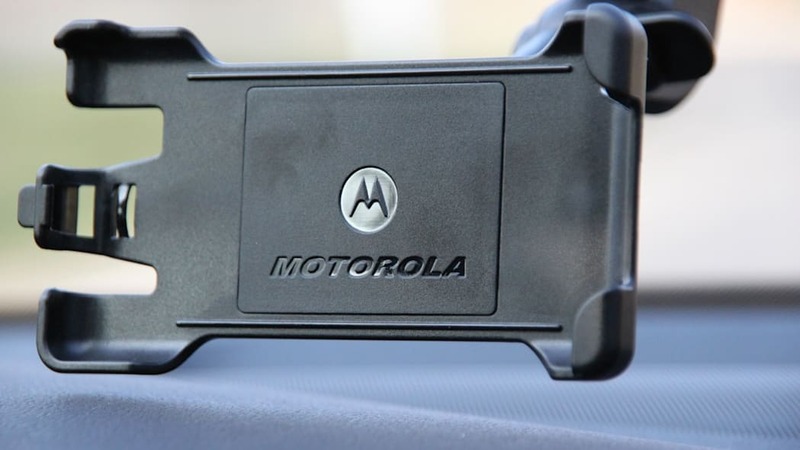 The dock doesn't actually have any connector on it, but a magnetic sensor detects when the phone is clipped in and switches the phone to car mode. 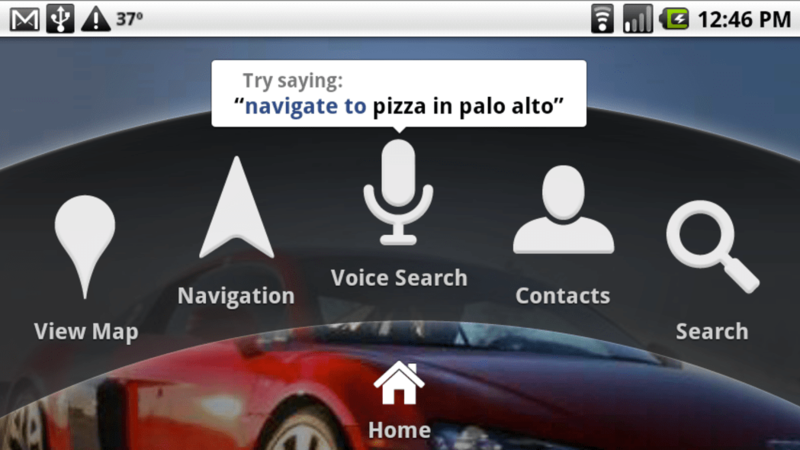 This mode gives a simplified interface with big icons that access maps, navigation, contacts and voice search. 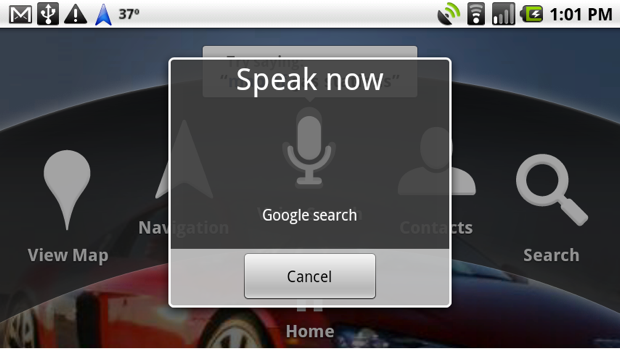 The voice search provides a natural language search function that scours both the data on the phone and Google's index. Unlike most in-car systems, you don't need to know specific commands, just say things like "navigate to joe smith" or simply say a name like "Julie". The system will search your address book and pull up matching names and you can just tap on the address to navigate or the number to place a call. All contemporary nav systems have databases of points of interest (POI), but car systems in particular are limited to what existed at the time the car shipped. 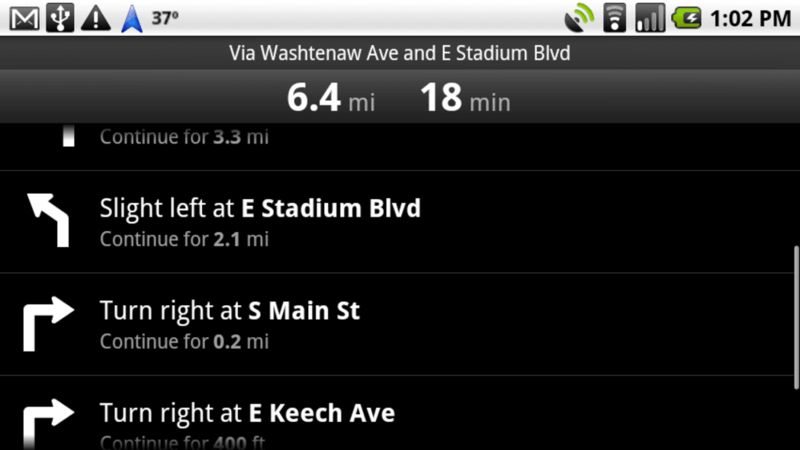 Doing a search on the Droid is as up to date as Google is, which is to say to the proverbial minute. 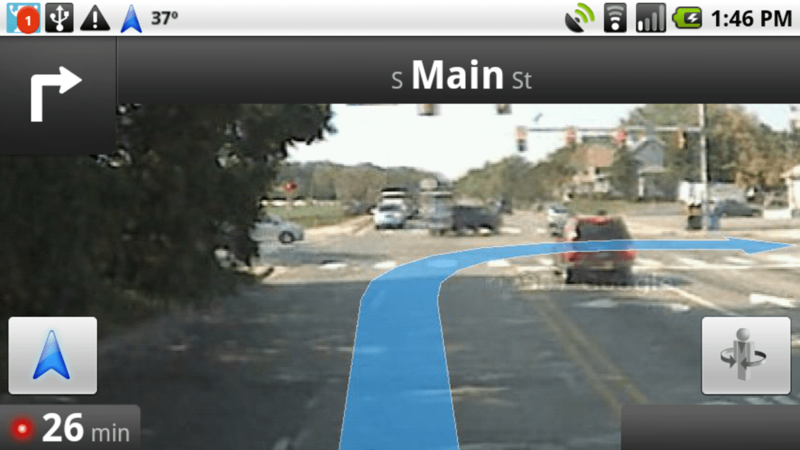 We tried out the Droid and its nav system in an Audi S4 for comparison with the factory system. Anyone who has ever used MMI in an Audi, iDrive in a BMW or any other such system knows that entering an address with a control knob is at best a clunky operation. The only factory system that comes close to Google's voice search is the voice command system used by Ford, and even it's not quite as robust. 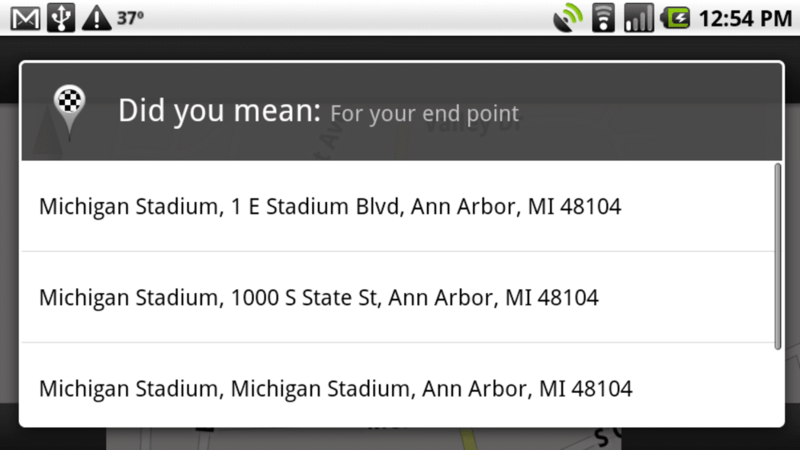 Google's voice search is not 100% accurate, but it's very good about 75-80 percent of the time. The biggest issue we had was with ambient noise that interfered with the system's voice recognition while we were driving. Recognition is vastly improved by pulling over before issuing commands. A big part of the reason it works so well is that Google has been using its free GOOG-411 directory assistance service as a training ground to improve its voice algorithms. Speaking of voices, the phone automatically cranks up the speaker volume when using the navigation so you can hear it while driving. It's plenty loud and quite clear, although the surprisingly natural sounding synthetic voice does mispronounce a few street names, but what nav system doesn't? Once you select an address as your destination, the system works pretty much like any other contemporary navigation system, although it does have at least one feature we haven't seen elsewhere. 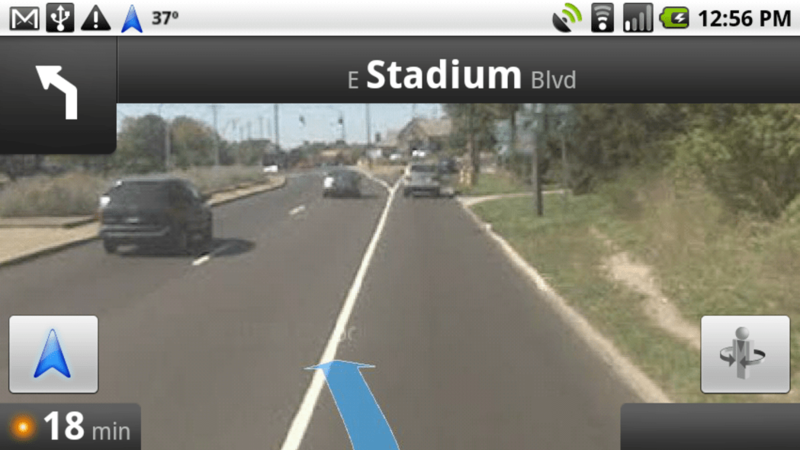 If the Droid is not in the car dock and you input a destination, three icons appear allowing you to choose the type of route: driving, walking or transit. The transit route will actually tell you how to get to the nearest public transit stop and provide the next three scheduled departures or future trips. Very handy for those times when the car is in the shop. 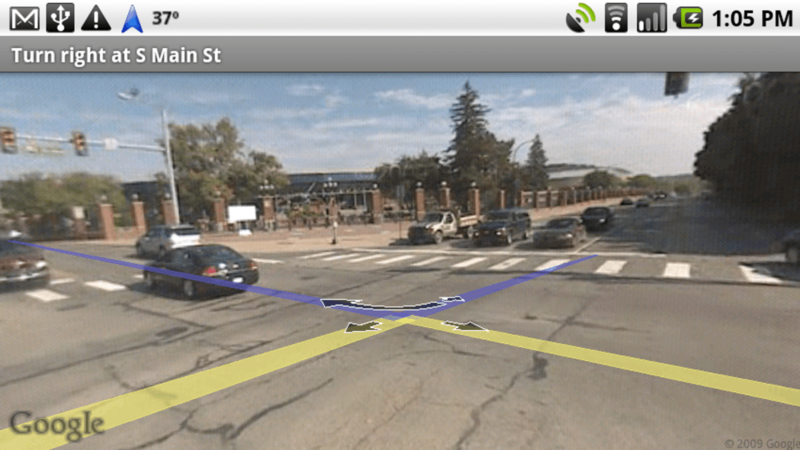 The Map view switches to a 3D perspective and traces the route ahead of you just as other systems do. Along the top of the screen you will see the next turn direction, and tapping on the arrow at either end allows you to see the previous or subsequent directions. Another feature that is truly unique to Google's navigation is Street View. 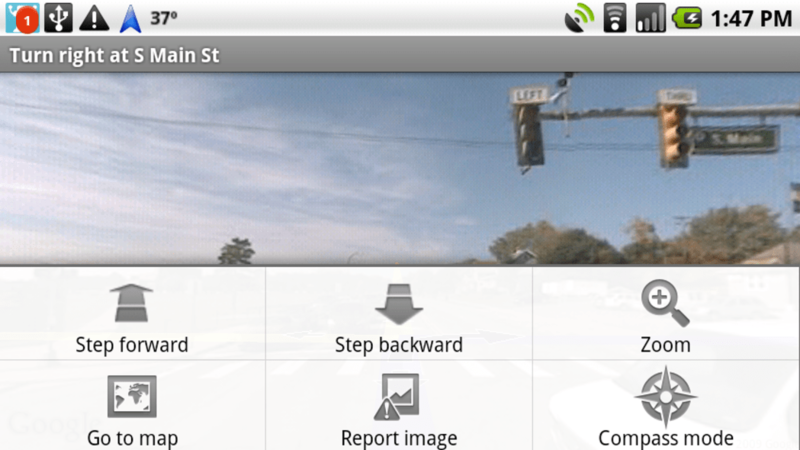 On the right side of the nav screen is the familiar Street View figure and tapping him switches out the traditional map for a photographic image of the street on which you are driving. When you reach your destination, you can also switch to Street View and compare what you're actually seeing to what you should be seeing. It all sounds great, right? 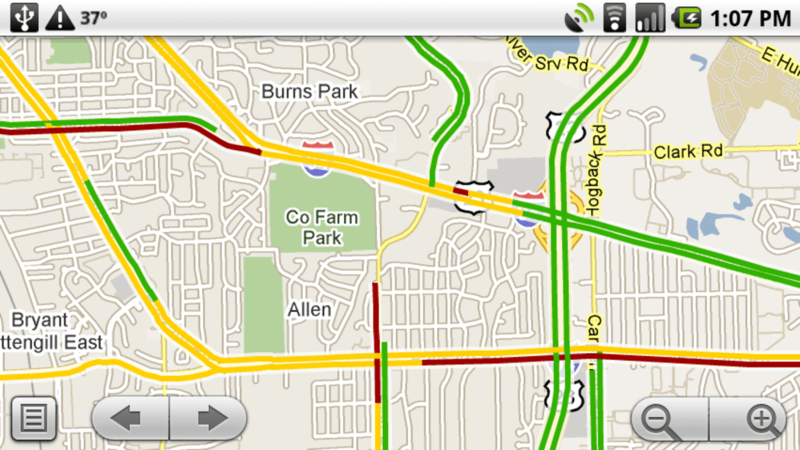 You don't have buy outrageous prices for a factory nav system. Remember that "sort of free" though? You do have to commit to paying Verizon their due every month for two years, and the company recently bumped the early termination fee on smartphones from $175 to $350. However, if you consider that most people carry a phone anyway and more and more are choosing devices like the Droid or iPhone, those are costs you would be spending anyway. 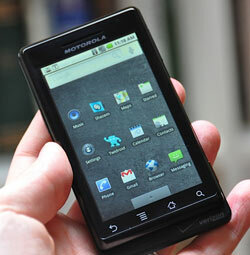 If you have no intention of buying such a phone, just drop $100-200 on a Tom Tom or Garmin Nuvi and be done with it. However, if you are trying determine whether to go with an iPhone or Droid for your navigation needs, consider that Tom Tom charges $99 just for its turn-by-turn app plus another $129 for the cradle. Magellan's app costs $79 and Navigon's runs $69. There are other less expensive navigation apps for the iPhone, but you get less features the lower you go and none match the feature set that comes standard with the Droid. One thing those nav apps on the iPhone do provide, however, is the ability to download and store all their maps on the phone itself. 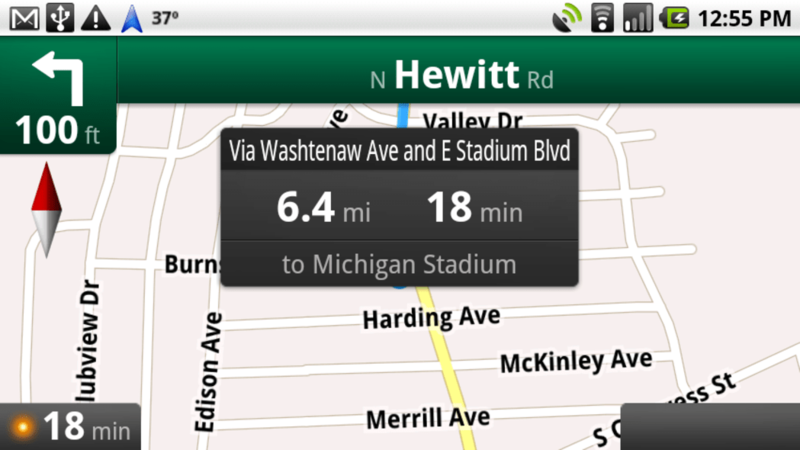 The Google nav app downloads maps as you go. 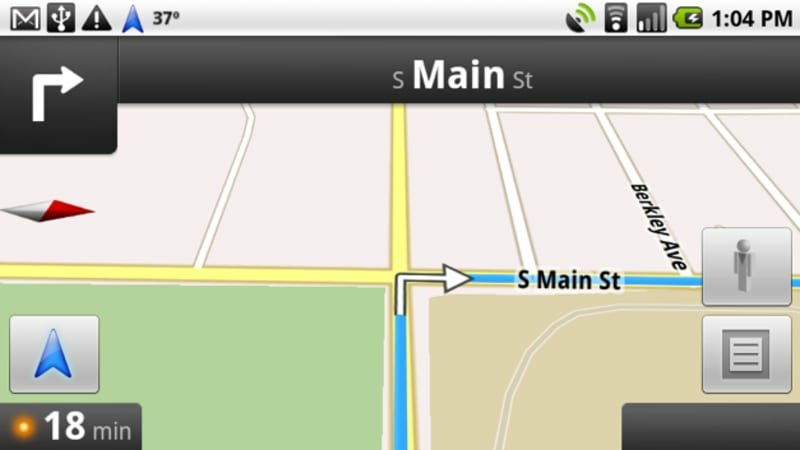 Google has stated it plans to update the Maps app on the iPhone with turn-by-turn directions, but that depends on Apple actually approving it, something that shouldn't be taken for granted. Other phones that support the Android 2.0 mobile operating system will soon feature navigation as well, and Google is now adding it to devices running Android 1.6.